Brambles Guide to Devon Add an Entry Page. Brambles Guide offers an opportunity to increase your presence on the internet at very little cost. We currently have more than 3500+ pages listed on some of the leading search engines including Google, Yahoo, MSN, Ask Jeeves, AOL and Alta Vista and feature 2000+ accommodation providers in the West Country (Cornwall, Devon, Dorset and Somerset) including Travelodge, Best Western Hotels, Holiday Inn and Express by Holiday Inn, Macdonald Hotels and Premier Inns. An Enhanced Listing is currently a one off £25 (usual cost £50) - see example below. This includes links to your online availability or booking partner (Eviivo, Booking.com, LateRooms etc) or your own website or other online advertising plus your e-mail address, phone number and fax, if required. 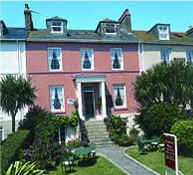 Lombard House Hotel in Penzance was built in the early 18th century. It is a Grade II listed building with many period features. Located on a quiet south facing terrace overlooking the sea and the promenade. Private guests car park. An elegant regency period house offering quality bed and breakfast where you can experience the unique and homely surroundings not found at other Hotels. Lombard House is conveniently located for the town centre, pubs & restaurants and many local attractions. The train and bus station is only a few minutes away and the Scillonian 3 ferry terminal and the Heliport for the Scilly Isles are also nearby. Frequent Question - "Why is it a one off fee rather than an repeating annual amount?" Answer - "Simple answer, we believe that most of the work is setting up the first advert, therefore we charge for setting up the first advert! After that we will make changes to text and pictures free of charge on the basis an advertiser e-mails us the exact text or picture required and we update the entry. This process takes only a few minutes and as most advertisers make very few changes we make no ongoing charges. Also, we want to have as much choice as possible for our site visitors and feel that a competitive advertising rate will encourage businesses to have a listing with us.